Not so fast! Citi Bike’s speedy electric-assist bikes will remain grounded for the foreseeable future. The Lyft-owned company told Streetsblog that it is still working with its supplier to figure out how to repair the locking front wheel problem that led all 1,000 e-bikes to be pulled from New York streets this weekend. 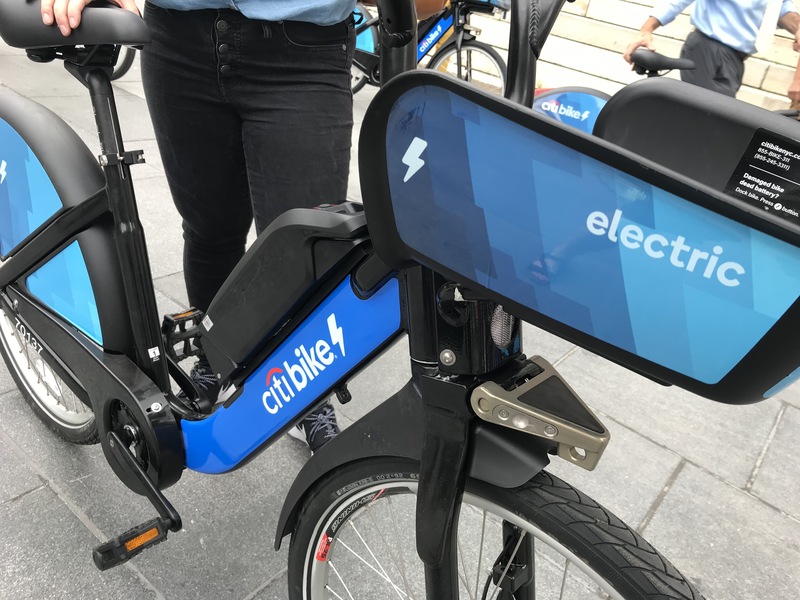 The same model e-bikes were also grounded by the Citi Bike counterparts in Washington, D.C. and the San Francisco Bay area. The company said it had experienced a “small number” of reported incidents, but since Citi Bike revealed its troubles early Sunday, many users have come forward to describe the problems first-hand. A Department of Transportation official said the city will be patient — as long as the Citi Bike fleet size does not dip far below the mandated 12,000 bikes. For now, Citi Bike has partially supplemented its fleet with non-electric bikes, which the company calls its “classic” bike. Citi Bike is required by contract to have 97 percent of the fleet — or 11,640 bikes — available every day. On Monday, only 10,421, or 87 percent, were available for use, according to the definitive world bikeshare map created by Oliver O’Brien. On Monday, Streetsblog asked Mayor de Blasio if the city has made plans to take over the Citi Bike system, which is one of the city’s most-used forms of public transit, but he wasn’t playing along. The mayor also said, “We haven’t seen a lot of this kind of problem with Citi Bike before,” but it is hardly the first time the company has faltered. Last year, Streetsblog reported exclusively that more than 40 percent of the bikes in the system were pulled from the streets in a repair crisis. It took more than a month for Citi Bike to fix the problem. Then, as now, the mayor declined to hit the company with sanctions for missing its fleet-size target. The company could have been on the hook for more than a million dollars in fines. Last year, during the repair crisis, Council Member Justin Brannan called on de Blasio to allow more bike share companies to compete with Citi Bike, which has not expanded very far beyond its main Manhattan/Brownstone Brooklyn footprint. The company promised last year to increase fleet size to 40,000 — and double the current service area — within five years, but that process has not begun. The city does not provide any subsidy to Citi Bike, making it the only form of public transit that does not enjoy taxpayer support. I can’t quite figure out what Citibike means when they say, in their email to customers, “The new bike model will be accessible just by scanning a QR code.” Why would a QR code be necessary? Realistically, even if this problem didn’t occur, rolling out 1,000 e-bikes which need to have the batteries manually swapped would have been a disaster. Maybe this is a blessing in disguise. While they figure out a fix, install proper charging stations. They’ll have to sooner or later. Manually swapping batteries isn’t something which worked well even with a few hundred e-bikes. It can’t work with thousands. I have been monitoring the e-bike deployment and they never got close to 1,000 in the wild. That being said, next week was supposed to be their big moment with the L train stuff. Instead, they’ve been silent about the new stations in Brooklyn. I think the idea is that instead of needing a key or having to go to the kiosk and get a code to punch in to the dock you’d just scan the QR code with your phone to unlock it. Seems like a good idea overall, provided your phone battery isn’t dead! They want to move people to use the app instead of the kiosk or key. Right now, the app gives you a code you awkwardly punch into the dock. It makes sense that you would point the app at the bike to unlock it. The new (newer) ebikes are supposed to have a screen for things like your speed and battery level. The current ebikes are like someone duck taped a battery onto a regular bike. They want to move people to use the app instead of the kiosk or key. If it’s not just conjecture, it validates my not-so-wild conjecture: Lyft bought Motivate because its business plan is to harvest, monetize, and sell personally-identifiable user data, turning patterns of where people go and what they do into marketing data. While they figure out a fix, install proper charging stations. Citibike stations do not require a connection to the electric grid. That’s the reason NYC chose them over competitors. The benefit is that stations can be moved quickly and inexpensively for special events. All good and well until they started rolling out e-bikes. Their idiotic model of manually swapping batteries just doesn’t work. It’s also very expensive given how much labor in NYC costs (hence the extra fee for e-bike rentals). They need charging stations, period. If it means they have less flexibility to move docks for special events, so be it. Well for one the default for new members is the app. To get a key, you need to call in and ask for a code and then make your way to one of the specific kiosks in a random area that can give you a key. I think its mostly cost savings, but youre right, the app does give them a lot more data. $10 they merge it into the Lyft app soon enough. This is what theyre doing with scooters in some markets. You put an origin and destination in the Lyft app and they show you scooters along with pool, regular, suv, luxury, whatever. A qr code would facilitate unlocking for folks who are buying a single use trip with the app. This also means single use will likely shift from a fixed price ($3 I believe) to demand based pricing. Thats great for a startup, but its not like Penn station is ever going to move. The most popular stations that have been around for 5 years should be upgraded with a grid connection. It’s also hardly groundbreaking–London, Paris, and other cities use hardwired docking stations without issue. Now that CitiBike has proven it’s here to stay, might as well go ahead and make the stations permanent. Really? They’ve stopped mailing keys? Yes, you have to jump through a few hoops to get one at this point. Why would the app give them more data? The key has all my info and they track that as well. Sounds a little paranoid. Your phone tracks your location far more effectively than Lyft would be able to by just tracking trips, so they’d lose handily to Google and Apple if this were the plan. They do move stations temporarily for events, street repair, and the like. I believe they did at one point more part of the huge station at Grand Central due to construction. That’s part of the beauty of the system they have, it’s flexible and nimble. And I don’t see how a few hard wired charging stations would help. Bikes move randomly around the city, and won’t end up at a charging station when they need a charge. It’s more than a little paranoid. Just how does the app collect more data? It doesn’t. It’s simply a way to unlock a bike, which tells them where you start and stop each trip. They’ve known that from day one, every time you insert a key. If you don’t want them to know, you can’t use the system. There is a “Ride insights” box in settings you can check that allows them to track your ride via GPS, which they say they collect as anonymized data. If you don’t check the box, they don’t collect the data, and using the app is no different than using the key. If you think the app is surreptitiously collecting data, then you shouldn’t even have it installed, but them you won’t know where stations are or how many bikes are in them. Youre being naive. The Uber app, for example, looks at your battery level and you get charged more if your phone is close to dying. Do you think Lyft is any different? That’s not actually true. Someone from Uber said in an interview that *users are more likely to opt to pay the surge price* if their phone battery is low, not that Uber is charging them a higher surge price if their phone battery is low. A Brooklyn developer has created a tool that makes finding shared e-bikes easier. Citi Bike will add more than 35,000 bikes to its current fleet of 10,000 or so as part of a five-year, $100-million investment from the company's new owner, Lyft.